Launching our chapter in ‘Bibliotherapy ‘ the new bibliotherapy guide to support the health and wellbeing of communities published by Facet UK. Thank you Dr Sue Reynolds for launching. I have a new article, Looking Beyond Traditional Bibliotherapy: A New View, recently published on Taylor & Francis Online and is in the latest issue of Journal of the Australian Library and Information Association, Issue 3. 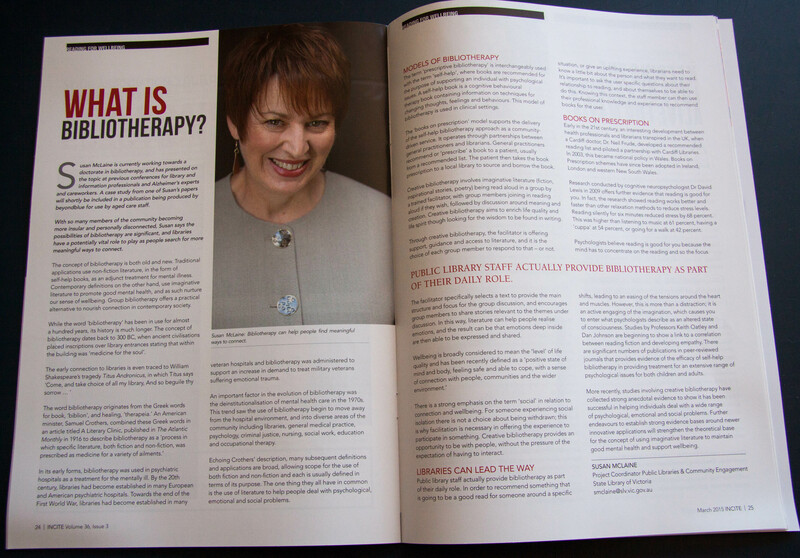 An article about my bibliotherapy work in a Melbourne prison. Bibliotherapy in INCITE March 2015, volume 36, issue 3, pp. 24-25. Great to see bibliotherapy recognised in the new Beyond Blue booklet showing what works to improve the wellbeing of older people.